3:30 pm: PRE-PRIMARY Parent Meeting 3.30pm - Meet the Teachers. More about PRE-PRIMARY Parent Meeting 3.30pm - Meet the Teachers. Coach Mr Steve Bilkey - Year 1 parent. Each week a different class or group will run the School Assembly. Year 6 Surfing - am. 3:00 pm: Quintilian Netball is open for Years 2 – 6, boys and girls. RSVP by Today Friday 15 February. Netball season is fast approaching and Perth Netball Association (PNA) would like to know how many teams we will be entering in the competition this year. Quintilian Netball is open for Years 2 – 6, boys and girls. There is a strict maximum of 10 players per team, so it is first in best dressed, sorry! If we not do get enough for one year group, we can do split teams, e.g. Year 3/4 team etc. Teams will need a coach and manager. If you would like to be involved, PNA do provide coaching courses. In previous years, game times have been on a Friday afternoon, Term 2 and part of Term 3. Year 6 – we are opting for Saturday morning as this does not interfere with discos. We will request this again this year, however it does depend on the number of teams they have in each comp. Netballers also have to commit to training once a week. This time depends on the coaches available in collaboration with the team. The cost is approximately $200 for the season. Please let me know if your child is interested in participating in our netball team by Friday 15 February. More about Quintilian Netball is open for Years 2 – 6, boys and girls. 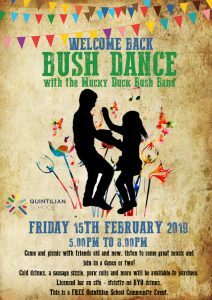 RSVP by Today Friday 15 February. Free Quintilian School Community Event Friday 15 February 5:00pm til 8:00pm – stay tuned for more information. Friday 15 February 5:00pm to 8:00pm at school.